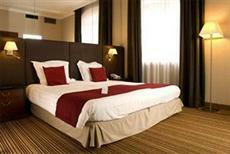 Guests of the Best Western Premier Carrefour De L Europe Hotel Brussels are located only 20 meters from the Grand Place. The Grand Casino Brussels is also very nearby, and the hotel is centrally located for people wishing to visit all parts of the city. Hotel amenities include 8 meeting rooms, a breakfast area, a bar, a chocolate shop, room service, and a free coffee corner. The Best Western Premier Carrefour De L Europe Hotel Brussels is located within walking distance of the metro and central train stations. Public transit can take guests to all areas of the city, including the Brussels Airport, which is 10 kilometers from the hotel. Rooms at the Best Western Premier Carrefour De L Europe Hotel Brussels include such amenities as bath tubs, cable television, desks, minibars, fax connections, radios, safes, showers, telephones, dataports, Internet access, and furnishings such as armoires and glass tumblers. The Best Western Premier Carrefour De L Europe Hotel Brussels is centrally located in Brussels, ensuring that guests are in close proximity to a number of shops, dining options, and entertainment choices, as well as nearby attractions.